I have now done for the developed world what I tried to do for the developing nations–estimate energy consumption in quads for 2030. The total matches closely with the U.S. Department of Energy’s Energy Information Administration, which predicted 279 quads for the OECD in 2030. My total was 280. So the difference is still the developing world. The DOE’s EIA estimates that the entire world will consume 721 quads in 2030–with the 279 coming from the current 34 OECD nations and the remaining 442 quads coming from the developing nations. Using almost the same methodology that replicated the DOE’s estimate for OECD energy consumption (which I discuss next), I came up with a much higher total for the developing world. My total for developing countries in 2030 was 672.3 quads, so my global total is also higher–952.3 quads in 2030. Again, the difference, 231 quads, is very large–more than the entire consumption of China and the U.S. combined today. If I’m right, we will be using 24% more energy in 2030 than anybody has predicted to date. This has the potential to have major consequences. There are two differences in the methodology I used when calculating the energy consumption of the developing world. First, I used the U.S. Census Bureau’s population projections for the developing world, as opposed to the medium projection of the UN that I used for the OECD nations. Some time soon I will compare the two and report on any discrepancy. In any event, I will homogenize my data sources and use one set of figures. Second, for the developing world I did not introduce a discount factor for energy efficiency. This was a conscious choice. I believe that energy efficiency is a factor in developing countries, but gets swallowed up by the massive appetite for growth. I think people moving into their first modern apartment in China will buy the cheapest washing machine available as opposed to the most energy efficient and that that will serve as an analogy for other decisions made regarding energy. Eventually that will change, and it will be a factor for later projections. But it’s too early to say that energy consumption will be mitigated by a 0.5% annual gain in energy efficiency for China and India as they move out of poor country status and into medium income territory. Happy to discuss any or all of this in comments. As a rough first draft of projected consumption, I don’t think this is too bad. I believe my view of energy consumption in the developing world is superior to that of the DOE’s EIA. And, I have doubts about their view of American energy consumption, detailed in other posts here, here and here. After more study, I may add in higher estimates of American consumption that could push the global total close to 1,000 quads by 2030. As you can see, I’m not done with all this yet. Data homogenization, comparing population estimates, etc. So I wouldn’t take this to the bank just yet. But it does honestly appear to me that the world’s energy consumption in 2030 will be significantly higher than projected. Alan Jones is a physicist and engineer who has worked for the BBC and the UK Civil Service. He currently consults for various Commonwealth and British Crown Dependency governments. He is a passionate follower of technology and technology history and understands that context and perspective is key in understanding what’s happening with energy now and what choices we need to make for the future. He volunteers this history of the adoption of natural gas in the UK, with all the attendant lessons relevant to us today. In the late 18th century the English learnt that coal [town] gas could easily be piped and stored to provide a brilliant light: so it spread quickly wherever coal could be moved by sea, river or canal. With the coming of the railways gas companies [Co‘s] sprang up along their routes. Many Co’s were private or public concerns, others owned by local councils eager to bring gas light to their communities. The Co’s continued to expand until the 1880’s when they met a check in the electric lamp. They turned to Welsbach’s incandescent mantle which gave as good a light and, since burners could be retrofitted, was much cheaper. But it also used far less gas than an open flame so the Co’s ended up with serious overcapacity at a time when the chemical byproducts of gasification were becoming more valuable than the gas and coke themselves. Their response was to grow by reaching new customers and providing new uses for gas, beginning with the gas geyser which gave hot water on demand: later followed by the gas cooker, the gas fire for room heating and even the gas refrigerator. By the 1950s they supplied almost all urban and suburban areas of the UK and began to run short of gas so they imported liquefied methane [LNG] by sea to enrich supplies. By then they had been nationalised, over 1000 Co’s had been merged into regional boards [Boards] with no effective central authority. Whereas electricity had been increasingly regulated to prevent overcapacity by creating the National Grid and finally nationalised under the Central Electricity Generating Board [CEGB] which competed fiercely with gas. But a new spectre haunted the Boards. that of cheap oil and petrochemicals. Moreover the CEGB had a successful nuclear programme offering inexpensive off peak power. It was the nightmare of the 1880’s all over again. Nothing daunted, the Boards answered knowing there were vast reserves of natural gas under the North sea and they had the infrastructure and expertise to distribute it very cheaply. The only question was how to get at it and convert the whole nation to it. So they set up their own joint committee, a very powerful one initially independent of the British government, [HMG], to consider the ways and means. A] That the oil majors who had the technology to do this saw no profit in gas nor in oil given cheaper fields elsewhere. To induce them to drill the Boards would have to offer them long term contracts at a price which would reward them. B] That methane had about twice the calorific value of coal gas by volume which would double the capacity of the existing infrastructure: and furthermore under low pressure could be supplied to new customers cheaply using plastic pipes. C] That since the Boards already had the necessary expertise the only problem was the sheer scale of the task: not only new pipelines but also that some 200+ million burners would have to be converted or replaced. D] Nevertheless they thought this practical if it were done in stages so the methane would reach each region step by step. They estimated complete conversion would take ten years. E] They assessed the likely overall economic benefit to the economy from cheaper energy as a one off gain of between ten and twenty percent in GDP over the ten years of conversion and might well create growth of half a percent per annum thereafter for many years as new customers came on line. F] But they also cautioned: ‘No such major change in the energy base of a great industrial power in so short a time has ever been attempted before’. It has never been attempted since either. But it was done. HMG accepted the Board‘s report in 1963 and in 1964 the rig Sea Gem struck gas in abundance although due to political turmoil the reorganisation of the industry was not finalised until 1967 when the project was well underway and virtually complete by 1974. By then the first oil shock had sent energy prices soaring but not gas because the enabling Act only provided for a cost plus pricing basis: and the supply contracts were fixed price. The results were astonishing: wherever and whenever the new gas arrived. Demand for fuel oil and paraffin [kerosene] declined rapidly as boilers were converted to gas. Central coal fired boiler houses, often producing electricity as well as district heating, quickly vanished: it was far cheaper and more efficient to pipe gas directly to where heat was wanted. Electric space heating almost disappeared. Even the mighty CEGB started to explore gas to meet peak loads and later dual phase gas/steam plant. This latter changed HMG policy, which in the early 1980’s had been that a new generation of nuclear stations would be wanted but only one was built, the CEGB argued successfully that gas/steam stations were far cheaper than nuclear both in terms of capital and fuel cost. Indeed when the utilities were privatised in the 1990’s they opted to replace coal fired stations rapidly in the ’Dash for Gas’. And still the gas marched on: over the sea to Ireland, North and South, and elsewhere. Its advance was temporarily slowed at the turn of century with HMG imposing taxes, havering about new permissions and such which led to a hiatus and short lived price spikes. But despite this UK consumers still enjoy some of the cheapest gas in Europe even with ‘green’ taxes on it. Finally and at last, to the dismay of the Greens and their political, business and ‘meeja’ allies, there are signs that HMG is slowly turning back towards a new dash for gas, the UK has reserves for centuries to come, and exploiting them now would end the recession almost at a stroke. © ajgjones 2012 whose moral right is asserted. Energy Consumption in the OECD, Part C: It works! I now have calculated the projected energy consumption for the 34 nations currently in the OECD at 2030. It very much looks like the Department of Energy’s Energy Information Administration used the same methodology I describe below to come up with a 279 quad projection for the 34 OECD nations in 2030. I took the medium population projection from the UN as published a couple of months ago. I reduced energy use per capita by 10% to follow predictions of energy efficiency gains predicted for that time period. And the total was almost exactly what the DOE came up with. Mine was 280.16 quads compared to their 279 quads. The reason I’m excited is that it provides indirect support for the choices I made in projecting totals for the developing world. However, to actually look at this as an optimum methodology, we have to consider some potentially confounding factors. The Rebound Effect. If our appliances, cars and buildings get more efficient, will that seduce us into consuming more energy? If so, then we must assume that the DOE built that in and the 0.5% per year gain in efficiency is net, not gross. Secondly, Do we have reason to assume that the Tier 2 countries will have a homogenized gain of 0.5% per year? The current variation in energy consumption between Tier 2 countries is huge, ranging from 568.6 mbtus per person in Iceland to 102 mbtus per person in Portugal. The variation in predicted growth in GDP is also quite large in Tier 2 countries, ranging from a CAGR % of 2.3% in Iceland to 0.99% in Spain. And the elephant in the living room in all of this is the U.S. Because it is so large in comparison to the rest of Tier 2 countries in the OECD (It has 34% of the population in all of Tier 2 and that will rise to 36% in 2030), if the U.S. does not experience the same 0.5% gain in energy efficiency, it has a disproportionate impact on the totals. The first tier of OECD countries is characterized by high levels of growth predicted between now and 2030. They are, not surprisingly, less developed than other members of the OECD and quite simply have more room to grow. This is rough substitution, folks, not an exact science. It has real advantages–it allows for judgement and doesn’t force a regional percentage on countries that don’t correspond to regional characteristics. But this should by no means be the final word on the issue. The Tier 1 countries used 30.1 quads in 2008. My methodology shows projected consumption in 2030 of 57.3 quads. That’s a compound annual growth of 2.97%. This is quite high–remember that the DOE’s Energy Information Administration predicts 0.6% for the OECD as a whole. And although some OECD countries will actually show a decline in energy consumption, the high performance of Tier 1 countries will make it difficult to bring the bloc as a whole in under their projected figure of 279 quads in 2030. After all, just these 8 countries have already brought in 20% of the ‘allotted’ 279 quads, and the average per capita consumption in 2030 will be below the average for the entire OECD as it stands today. How many countries in the OECD will increase energy consumption as fast or faster than China? In 1980 the OECD consumed 178 quads. By 2008 that had climbed to 243 quads. 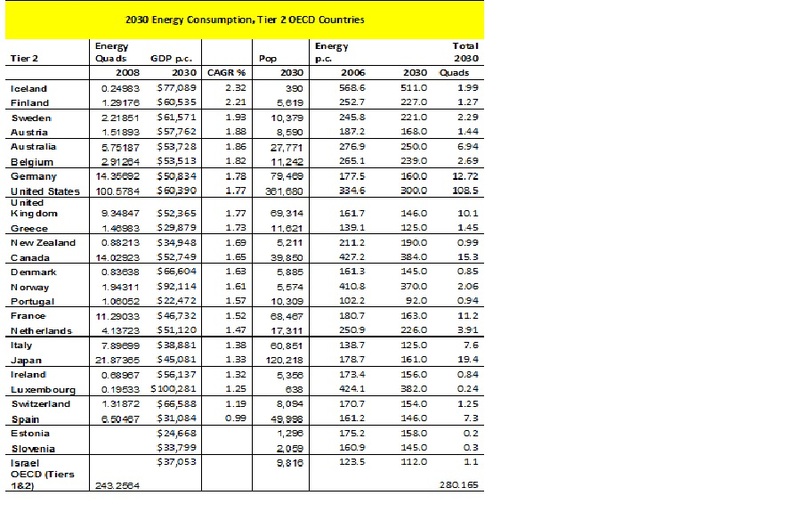 The U.S. DOE projects OECD energy consumption at 279 quads in 2030, a compound annual growth rate (CAGR) of 0.6%. In 2008 there was large variability in energy consumption per capita within the 34 OECD countries. The average for all 34 OECD nations was 205 mbtus per person per year, and the two countries closest to that average were New Zealand (211) and South Korea (193). I was almost pleasantly surprised to learn that the U.S. is not the highest consumer of energy per person in the developed world. In the OECD, that honor goes to Iceland (569 mbtus per person per year), followed by Canada (427), Luxembourg (424) and Norway (411). The U.S. is number 5 with 335. The lowest consumers of energy on a per person per year basis were Turkey, with 55.5 mbtus per person per year, Mexico (68.5), Chile (77.6) and Poland (100). So. Let’s acknowledge that the OECD is not a homogenous unit. Let’s accept that there are countries that are stable and will probably not increase their energy consumption much–that the DOE is correct about the 0.6% CAGR for these countries. And let’s look at what happens when we treat the other countries in the same way I treated developing countries. By finding ‘partner’ countries that we can compare their development path with. 1. One reason that Angela Merkel may have felt able to throw nuclear under the bus is the fact that Germany’s population will decrease by 3 million souls between now and 2030. Fewer lightbulbs to power… The same logic may permit Japan to pursue similar non-nuclear policies, as their population will decline even more, by over six million people. 2. The data I’m looking at is tempting me to treat America as a (gulp… big one here) well, developing country. I know that sounds like a stretch and I’ll have to really make the case for it, but if you look at metrics like population per square kilometer (okay, mile–same difference) or historical growth in things ranging from GDP to population growth, we look a lot more like Brazil than we do Switzerland. Obviously you have to ignore our income and total GDP, but if you can ignore them you’d have to figure our best days are ahead of us. And since that’s what I want to believe (and have been writing about for years), I’m certainly going to look into it further. Thanks for your patience. I should have the OECD projections done shortly.